White certificate obligations impose energy savings targets on energy companies and allow them to trade energy savings certificates. They can be seen as a means of internalizing energy-use externalities and addressing energy efficiency market failures. This paper reviews existing evaluations of experiences with white certificate obligations in Great Britain, Italy and France. Ex ante microeconomic analysis find that the obligation is best modelled as a hybrid subsidy-tax instrument, whereby energy companies subsidize energy efficiency and pass-through the subsidy cost onto energy prices. Ex post static efficiency assessments find largely positive benefit-cost balances, with national differences reflecting heterogeneity in technical potentials. Compliance involved little trading between obligated parties. Whether the cost borne by obligated parties was recovered through increased energy revenue could not be ascertained. Ex post dynamic efficiency assessments find that in addition to addressing liquidity constraints through subsidies, white certificate obligations seem to have addressed informational and organisational market failures. Confidence in these conclusions is limited by the fact that no econometric analysis was performed. Yet the lack of publicly available data, a counterpart to the rationale of the instrument of harnessing private financing, makes any empirical evaluation of white certificate obligations challenging. 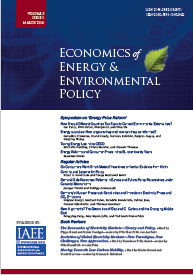 Published in Volume 4, Number 1 of The Quarterly Journal of the IAEE's Energy Economics Education Foundation.